Are You Brave Enough for Niagara Falls’ Newest Daredevil Water Sport? If you’ve ever wanted to soar high into the air via jetpack, you’re in luck — the latest extreme water sport craze has come to Niagara Falls. Flyboarding, which allows you to rise to heights of 35 feet on a water-powered board, has been taking the world by storm. Now, with help from FlyBoard Niagara, you can be the first of your friends to try the new sports craze. 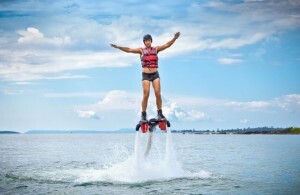 Flyboarding was invented in 2011 by French personal watercraft racer Franky Zapata. The device is powered by the engine of a Jet Ski, which forces water through a hose attached to the bottom of the flyboard. A handheld throttle allows the rider to control twin jets of water that can propel him or her up to 35 feet into the air or 35 feet under the water. 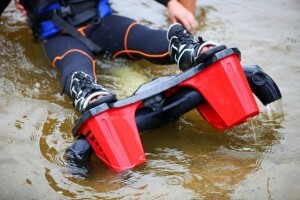 The rider is secured to the flyboard via bindings similar to those found on a wakeboard. Bending and swaying allow the rider to move about in the air. With practice, the flyboard rider can do more than just launch him or herself into the air. He or she can do tricks, such as backflips, or dive in and out of the water like a human dolphin. Though it might seem intimidating, it doesn’t take long to learn to flyboard. The typical flyboarding session runs about half an hour, and most people get the hang of the device in about 15 minutes. When you’re planning your trip to Niagara Falls, don’t forget to make time on your itinerary to try flyboarding. If you love extreme sports or water sports in general, you’ll love flyboarding. Craig Bagshaw launched FlyBoard Niagara earlier this summer, along with partner Rodney Moore. Bagshaw runs the business out of the Greater Niagara Boating Club. Bagshaw left his full-time job operating heavy equipment to open FlyBoard Niagara. Since his partner, Moore, still works full-time, Craig Bagshaw gets some help running the business from his son, 17-year-old Tyler. The younger Bagshaw is adept at performing flyboard tricks; when business is slow, he helps drum up customers with his demonstrations. Tyler also drives the Jet Ski that powers the flyboard. Flyboarding rates are set by the Zapata Racing Company, which sells franchises like the one Bagshaw and Moore own. A 30-minute, one-person flyboarding session costs $149, while a 60-minute session, which can be split between two people, costs $249. The device can accommodate riders of all shapes and sizes. FlyBoard Niagara welcomes teenage flyboarders, as long as they have their parents’ permission to try the sport. Riders will be welcomed every day for the rest of the summer. If you’re traveling to Niagara Falls this summer, don’t miss your chance to try flyboarding, an exciting new water sport that lets you leap through the air and water like a dolphin, or fly around like a superhero. This latest addition to the area’s attractions is just one more reason to visit Niagara Falls — as if you needed another.